Care For Nature: Preserve It Today Or Mourn Tomorrow! HomeShort StoriesCare For Nature : Preserve It Today Or Mourn Tomorrow! 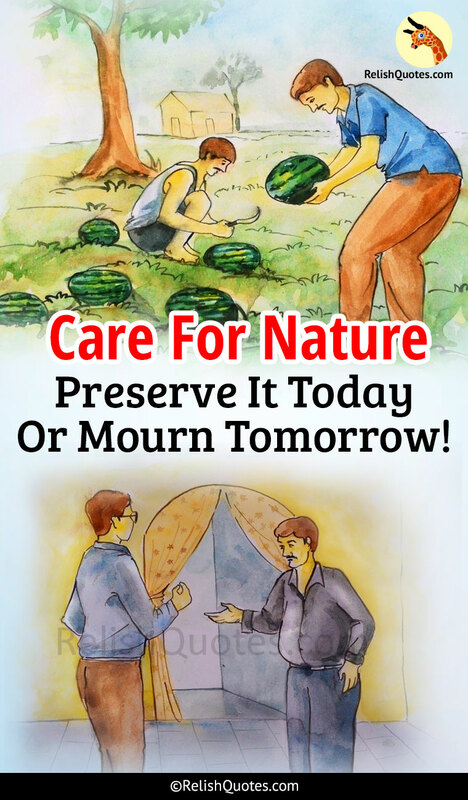 Care For Nature : Preserve It Today Or Mourn Tomorrow! It was early morning and Mr. Sharma went to his farm like usual. Although, he was a well-known businessman in the city, he usually visited his native once or twice in a month. He had inherited a large farm from his father and loved to see the plants growing and the flowers blossoming in the farm. Among the wide variety of plants and trees, his favorite was the watermelon plant. Watermelon fruits grew in abundance in a vast area and this fruit and he had earned a name in the nearby locality for the fresh organic fruit. Large size watermelon with a very sweet taste which his family and he would relish on along with the neighbors. Mr. Sharma was very fond of his farm and it had been almost 25 years that he maintained it. He had only one son Rahul who graduated with a MBA degree from US. Rahul returned to India and was amazed to see his father’s farm. He was not interested in the family business. He said, ‘Dad, please transfer the ownership of this farm to me. I shall turn it into gold’. Although Mr. Sharma was reluctant initially, he finally agreed. Mr. Sharma said, ‘Rahul, as you know this farm is my treasured property. You grew up eating the fruits and vegetables of this farm, especially the watermelons. Please take good care of it son. Dinu Kaka, our farmer will anyways help you in maintaining it’. ‘Sure dad, don’t worry. I have big plans for our farm’, replied Rahul. Mr. Sharma left for the city and got occupied with his work until he returned to his native after one year. He was shocked to see the state of his farm and called Rahul. ‘Rahul, what is this? I see very few plants and the quality of fruits and vegetables have degraded drastically. The size of the watermelons are now not even half of what it used to be’. Rahul replied, ‘Dad, it’s nothing. Only this year it is like this due to insufficient rain. It will be fine next year. Don’t worry about it’. He left the hurriedly leaving his dad disappointed. Dinu Kaka replied politely, ‘Sir, after you left the place your son started doing watermelon business. As profits were very high in selling the watermelons, he got the small watermelon seeds from the market and asked me to plant those. They grow in huge numbers and Rahul started selling them for higher profits’. Mr. Sharma sighed, ‘Oh, I see. Where did you get these big watermelons then? ‘I got it from your farm Sir. I saved the seeds and planted them in my small garden. You will be happy to see the big watermelons bloom’ replied Dinu Kaka. Mr. Sharma went home and found Rahul relaxing. He said, ‘Rahul, I have done the biggest mistake in my life by giving you the farm. You did not realize the importance of it. We all grew up eating the tasty big watermelons from our farm and now you have completely commercialized it. You have replaced natural products with pesticides, artificial fertilizers and hybrid seeds which gave you quantity but not quality. You have in turn put the future generation in danger just to make some extra bucks. Our farmer’s children eat good quality fruits, whereas your children will eat these chemical fruits and fall ill’. Rahul was shocked on hearing his father’s words. His father was right, he realized his mistake and stood silently seeing his father grief about the farm. The way Nature cares for Mankind, similarly we humans should take care of Nature to make Mother Earth eco-friendly.